We introduced the transmission system, the vacuum system and the vacuum pump:Lubrication system in last article Paper Machine Auxiliary Equipment. This time we will introduce other auxiliary equipment of paper machine. Hydraulic system: including hydraulic control and hydraulic transmission, the main control of the paper press section of the press roller action calender, coiler, rewinding machine and network pressure tensioning roller action. 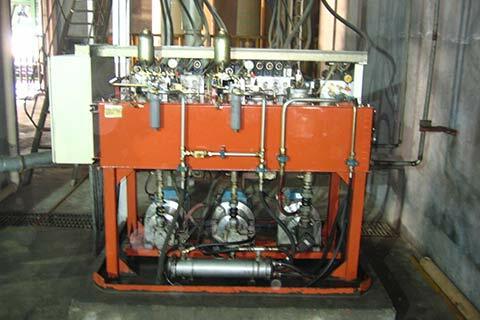 Air Compression System: used for the calibration of various pneumatic valves, cylinders, mesh blankets, and threading systems and production cleaning. Steam and condensate system: The essential configuration of the packaging machine, steam is mainly used for the drying of the paper web, heating of the pulp, white water and production of auxiliary materials. The condensed water is condensed water used in the drying section of the steam. Heat recovery and ventilation system: The system is mainly used for the waste heat recovery and utilization of the drying section of the paper machine to ensure that the drying section has a stable temperature, humidity and reduces the impact on the workshop and the surrounding environment. Cooling tower: White water is cooled by natural wind.